Movie Ramble: The Bad Lieutenant: Port of Call – New Orleans. The Bad Lieutenant: Port of Call – New Orleans. “Neither a sequel nor a remake” is how Werner Herzog described his “rethought” of the 1992 cult classic Bad Lieutenant directed by Abel Ferrara. In the original Harvey Keitel plays a cop only known as the Lieutenant who staggers around New York taking immense amounts of drugs and alcohol, stealing from villains, participating in orgies all of which is rapped in a covering of Catholic guilt. 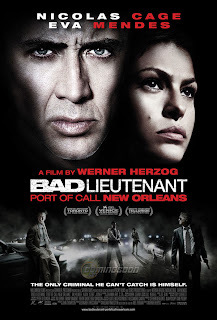 In The Bad Lieutenant: Port of Call – New Orleans (2009) Nicolas Cage plays Lieutenant Terence McDonagh a man with a permanent back problem acquired when he rescues a felon from a flooded basement cell during Hurricane Katrina. Following the incident his is permanently on subscription drugs with in turn fuels his appetite for more illicit drugs, which he obtains from any and every source he can. A man with a problem, one that matches the size of his gun! Ignore what Herzog claims; his new film does bear a resemblance to the original with some scenes and situation’s lifted direct from the original movie. The best example is the scene where McDonagh attempts to extract drugs from a couple he suspects of dealing, a scene that can’t stand up to the strength and disturbing nature when Keitel’s Lieutenant abuses two girls for driving without a licence, a scene your unlikely to forget. Compared to Harvey Keitel, Cages portrayal of the out of control police officer comes across as hammy. To be blunt this film is a farcical remake of a cult classic and should not have been attempted by Hertzog or any one else. Another dreadful remake to steer clear of - take my advice watch the original.